In March 2008, the nationwide virtual tumourbank project was launched by the Belgian Minister of Health, Ms. Laurette Onkelinx (initiative 27 of the Belgian Cancer Plan). 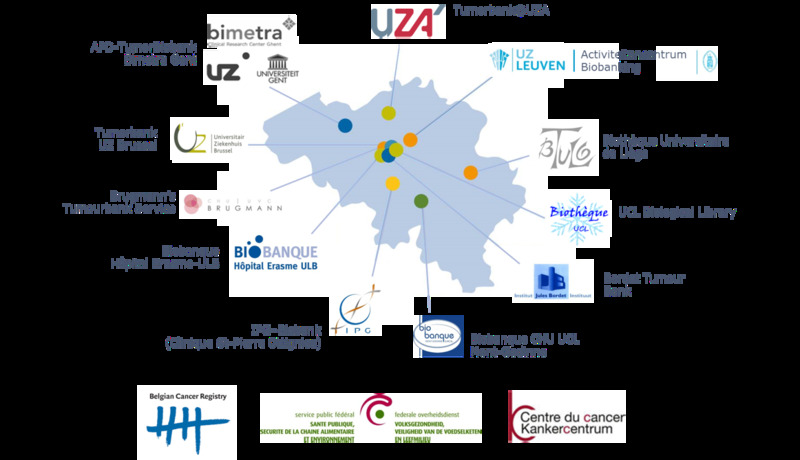 The Belgian Virtual Tumourbank (BVT network) encompasses the tumour biobanks from eleven Belgian university hospitals (click here for the list) that collect and store residual human tumour samples locally. 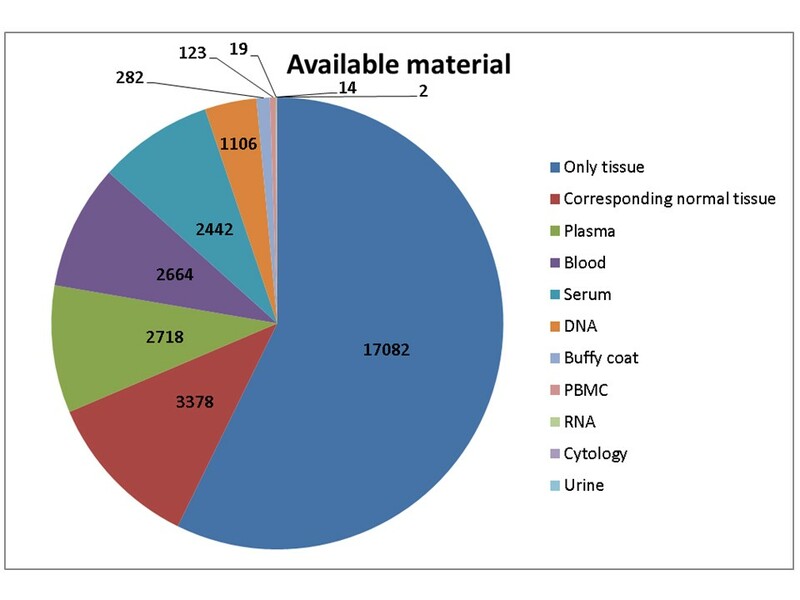 In order to facilitate the search for tumour samples scattered among different Belgian institutions, data collected at sample level is made available for researchers via the online BVT catalogue (BVTc) application. A high quality of the data on the tumour sample requested by scientists for research in oncology is guaranteed by automatic and manual controls performed by the BVT project team at the Belgian Cancer Registry. This third newsletter highlights the rare cancers available in the online BVT catalogue! The BVT catalogue can facilitate the search for tumour samples scattered among different local biobanks, especially for rare cancers. If you want to know if the specific samples for your research are available in our catalogue, please request full access so you can browse freely through all available sample data and find the matching samples for your study! Rare cancers have been defined as cancers with an incidence rate lower than 6 per 100,000 per year for both sexes by the RARECARE project (http://www.rarecare.eu/). This European project quantified the burden of rare cancers in Europe and showed that rare cancers pose an important challenge in Europe. In 2014 the Belgian Cancer Registry has published a report on rare cancers in the Flemish region (for more information click here). The selection of rare cancers in the current newsletter is based on the RARECARE cancer list, a list of common and rare cancers that has been made publicly available (click here). The definition of each tumour entity is done based on a combination of morphology and topography codes according to the International Classification of Diseases for Oncology, 3rd edition (ICD-O-3). Which rare cancers are available? In total, 84,307 registrations were available in the BVT catalogue at the moment of selection (March 2018). Based on the criteria proposed by the RARECARE project, 23,847 registrations from 12,043 patients with rare cancers could be retrieved in the BVTc. The majority of the registrations concern male patients (13,199 or 55.3%) while 10,648 of the registrations (44.7%) concern female patients. 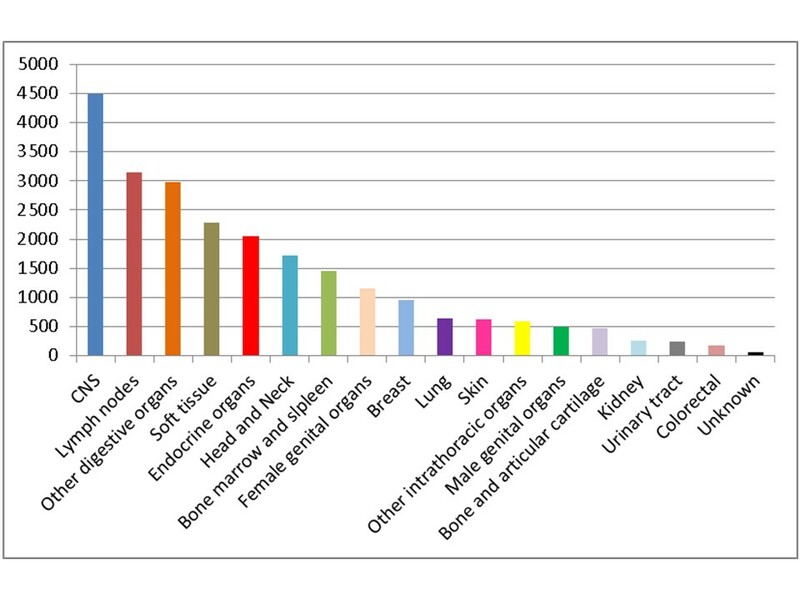 The most common sample localisation of the rare cancers in the BVTc is the central nervous system (18.8%). Lymph nodes and other digestive organs (like stomach, liver and pancreas) complete the top three of sample localisations with 13.2% and 12.5% respectively. As expected Head and Neck tumours are numerously present as well in the catalogue (7.2%). For 57.3% of the registrations, only residual tumour tissue is stored. For some patients, also additional types of material are stored at the local biobanks and registered in the BVT catalogue. The most common type is corresponding normal tissue: 11.3% of the registrations. Blood (8.9%), plasma (9.1%) and serum (8.2%) are also available in some local biobanks. 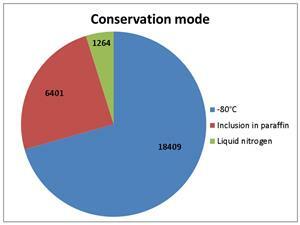 More than 70% of the registrations (18,409) are stored at -80°C, 24.6% are included in paraffin (6,401) and 4.9% are stored in liquid nitrogen (1,264). Conservation delay, the time between excision and fixation or freezing of the sample, is less than 30 minutes for 18% of the registrations. For 7,254 registrations (30%) the conservation delay is more than 30 minutes. Flyers on the BVT project have been distributed at the Belgian Week of Gastroenterology (21-23rd February, Antwerp), BSMO annual meeting (23-24th February, Oostende), OncoPoint meeting (28th February, Gent), Oncoforum (9th June, Leuven) and the Europe Biobank Week (4-7th September, Antwerp). 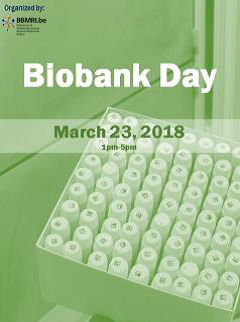 The Belgian Virtual Tumourbank team was present at the first Belgian Biobank Day (23rd March 2018, Gent) organised by BBMRI.be and gave a presentation on quality control of data. 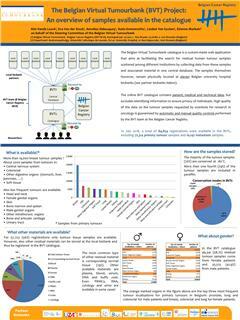 The Belgian Virtual Tumourbank team presented a poster at the Europe Biobank Week (4-7th September 2018, Antwerp) in the category "Data sharing in biobanking – Discoveries, Novelties, Realities". To gain full access to the online BVT catalogue, please follow the procedure indicated here. Do you wish to be kept informed in the future? Click here. Click here if you do not wish to receive our information any longer.